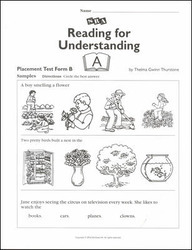 Improve students' overall reading comprehension with Reading for Understanding, an individualized supplemental program that also strengthens inferential skills, critical-thinking skills, and reasoning skills. Use these to place students at the correct level of difficulty and to analyze students’ progress as they proceed through the program. One Placement Test is needed for each student at each testing point. Directions on how to administer are provided in the Teacher’s Handbook. Answers are provided in the Teacher’s Handbook.